VitaPhyscal offers a range of osteopathy and massage treatments. From our centre close to East Rainton we help you become a happier, healthier you. Our friendly, qualified staff work with all types of conditions to relieve pain, restore function and provide much needed relaxation where required. Founded by osteopath and massage therapist team Jason and Bronyia. Vitaphysical was originally called the Sunderland Back Pain Centre. Though chronic back pain is still one of the most common reasons for patients to visit Vitaphysical, the team now offers more inclusive massage and osteopathy services, treating conditions from headaches through to posture problems and helping athletes recover from injury too. 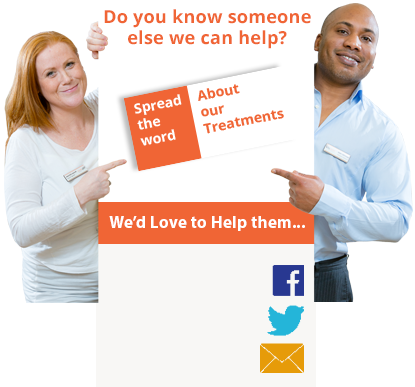 Our what we treat page lists the conditions we successfully work with. Don’t worry if you can’t see your problem listed, we offer a free telephone consultation, helping us to match you with the best treatment and team member to treat you. Each with their own specialism, our massage therapists truly love what they do and we’re able to offer a vast range of treatments thanks to their qualifications and experience. From full body massage through to sports massage and Thai massage, we’lll find the right fit to treat your body’s aches and pains and help soothe stress away. We’re incredibly pleased to be able to help the clients that come to us, but it is especially rewarding to work with those who have undergone other forms of treatment with limited success. Many of our patients come to us after courses of physiotherapy or sessions with chiropractors. For your peace of mind, we offer a 100 % money back guarantee on all of our services and you can find some of patient success stories on this website. Our John Street clinic is just a short distance from East Rainton along the A690 and free patient parking is available on site. Visit our how to find us page for further information. If you would like to arrange a visit to our centre for osteopathy or for massage therapy, please use our online booking form or get in touch via email on info@vitaphysical.co.uk or telephone us direct on 0191 565 886 and we will be happy to arrange an appointment at your convenience.